Earn $64.95 in Rewards credit. Click to learn more. 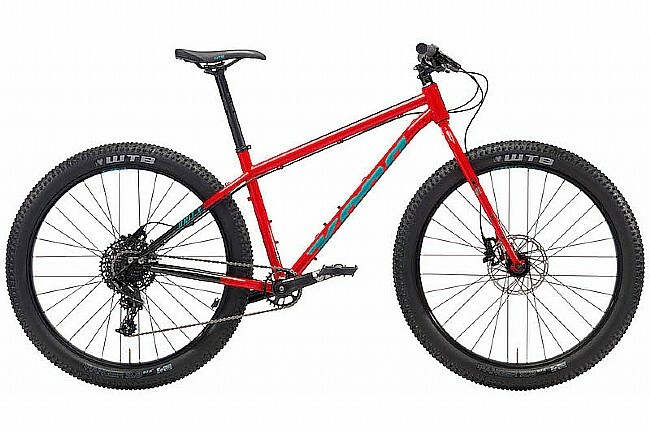 Kona Bicycle’s 2018 Unit X Mountain bike features a durable and lightweight Reynolds 520 butted cromoly frame, Kona Plus fork, SRAM NX, and tubeless compatible 27.5+ wheels for smooth yet nimble trail riding and bikepacking. Frame Material: Reynolds 520 Butted Cromoly. Brakeset: SRAM Centerline 180mm (front); 160mm (rear). Seatpost: Kona Thumb w/Offset 31.6mm. Wheelset: WTB Scraper i40 Pinned TCS..
Rims: WTB Scraper i40 Pinned TCS. Hubs: Formula 100x9mm (front); 135x10mm (rear). Tires: WTB Ranger TCS 27.5x2.8". Manufacturer Warranty: 1 year limited warranty on complete bike. Limited lifetime warranty on frame (excluding Kona Carbon models) if registered within 3 months of purchase; otherwise, 3 years limited warranty on frame.